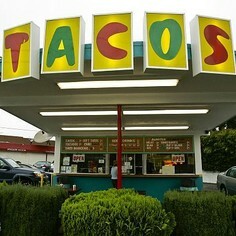 This 50 year old Googie style taco joint is in jeopardy of closing. Henry’s Tacos, famous for its Mexican street food and Googie architectural style, is in jeopardy of being closed down. Last week, the Los Angeles Cultural Heritage Commission voted 5-0 to recommend that 50-year-old eatery be named a Historic-Cultural Monument, however the owner of the land does not want the restrictions involved in the honor because nothing else could be built up on the land. To fight the impending closure and to support the restaurant owner, click to sign this online petition. At last—we’ve been dreaming about this one! Joan’s on Third has announced an expansion to the 818. No word on the location yet, but this gourmet marketplace and cafe on Third Street has become known as Los Angeles’ answer to New York’s Dean and Deluca. Just call Studio City the “land of burgers” as another burger destination joins the meaty fold — enter 25 Degrees, the much talked about restaurant from renown husband and wife team, Tim and Liza Goodell. No word yet on the exact address. 25 Degrees will join Umami, The Counter and the soon-to-open Stout Burger in the East Valley. 25 Degrees has locations in Hollywood, Huntington Beach and Bejing. Crave Cafe just opened its second location in Studio City moving into the space vacated by Georgio’s Cucina in the Trader Joes shopping center (the original is in Sherman Oaks). This order-at-the-counter casual eatery is redesigned into a big, light open space with high ceilings and plentiful indoor/outdoor seating. 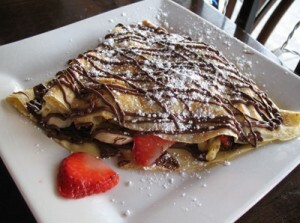 The well-priced menu ($5-$10) includes crepes, omelettes, pancakes, waffles, paninis, soups, salads, flatbread pizza, smoothies, and more. The big news is that it’s open 24 hours a day Monday-Saturday and until midnight on Sunday. 11992 Ventura Blvd., Studio City, 818.763.9000. Also coming to Studio City— Which Wich, a sandwich franchise offering more than 50 different types of sandwiches, is replacing La Salsa also in the Trader Joes center. Cafe Bizou in Sherman Oaks is featuring three course prix fixed menus for lunch ($17) and dinner ($28). Also, through December, buy a $50 in gift certificates and receive a $10 gift card, valid to use in January for dinner. Rosti opened a new restaurant last month in Calabasas at 23663 Calabasas Road. In celebration of the holidays and in keeping with the restaurant’s concept of community building, Hugo’s is partnering with El Nido Family Centers, encouraging diners to make any size donation through December 31. Hugo’s will generously match all donations during this time, dollar for dollar. Diners may charge an amount to a gift card and Hugo’s will convert it to cash. All donations are tax deductible. Hugos is located in Studio City, Agoura Hills and West Hollywood. Hollywood hip recently arrived in Agoura in the form of The Sunset Room in the space that previous housed Hamburger Hamlet. The 400 seat sophisticated venue with a touch of old Hollywood glamour includes a dining room as well as outdoor cabana seating. The seasonal menu consists of small plates, salads and wood-fired and grilled entrees. DJs spin music nightly.